George William West appears to have been the first professional photographer to reside in Rottingdean. Previous to his arrival in Rottingdean, the village was pictorially recorded by photographers who travelled the 4 mile journey from Brighton. If the inhabitants of Rottingdean wanted a photographic portrait, they would have had to make a trip into Brighton or wait until an itinerant photographer passed through the village. George William West was born in 1868 at New Cross, South East London. (Today, the New Cross area is in the London Borough of Lewisham). By the early 1890s, George West was working as a photographer in Sussex. In 1892, George William West married Lillian Gould (born 1873, Peckham, Kent) [Marriage registered during the 2nd Quarter of 1892 in the Steyning District, which then covered Rottingdean]. The following year, in the village of Rottingdean, Mrs Lillian West gave birth to a boy, who was named George West, after his father. [The birth of George West junior was registered during the 2nd Quarter of 1893 in the Lewes District, which now included Rottingdean]. The 1901 Census records 32 year old George William West as a "Photographer (own account)" residing in Rottingdean's High Street with his wife Lily and their 8 year old son, George. After their marriage, George and Lily West settled in Rottingdean. For the first ten years, George West was based in Rottingdean's High Street, but by 1905 he and his family were living in Vicarage Terrace, a row of small cottages set back from Steyning Road. ( Today, the cottages in Vicarage terrace are situated opposite the Church of Our Lady of Lourdes, a Catholic church which was built in Whiteway Lane in 1957 and consecrated the following year). Although George William West was active as a photographer in Rottingdean for 15 years, he appears to have taken very few 'studio portraits' (see example below). West was mainly an "outdoor photographer" and was more likely to take group pictures on location (see left) or take family photographs outside the homes of his customers (see below). By 1909, George William West had established a photographic portrait studio in Brighton at 11 West Street. G. W. West's studio at 11 West Street, Brighton was short lived. The 1911 edition of Kelly's Directory of Sussex does not list George William West as a photographer, either in Brighton or Rottingdean. 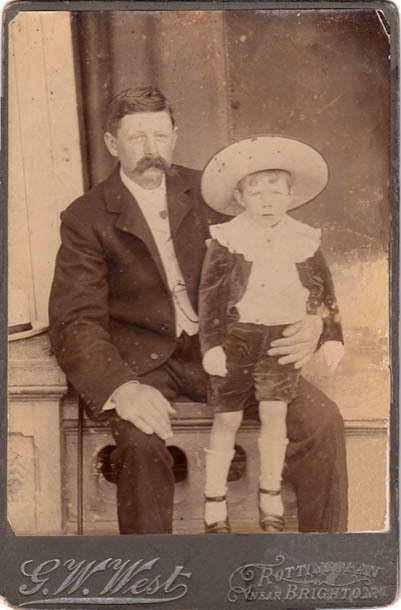 [ABOVE] Cabinet portrait of a man and his son, photographed by George William West of Rottingdean, near Brighton. Nelson Stenning was born on 27th October 1850 at Twineham, a small Sussex village situated five miles west of Burgess Hill. Nelson was the son of Harriet and William Stenning, a shoemaker of Twineham. After serving his apprenticeship as a baker, Nelson Stenning married Elizabeth Lucy Alderton (born 1850, Lewes) at All Saints Church in Lewes, on 1st October 1873. The couple began their married life in Brighton, where their daughter Emily Harriett Stenning was born in 1875. 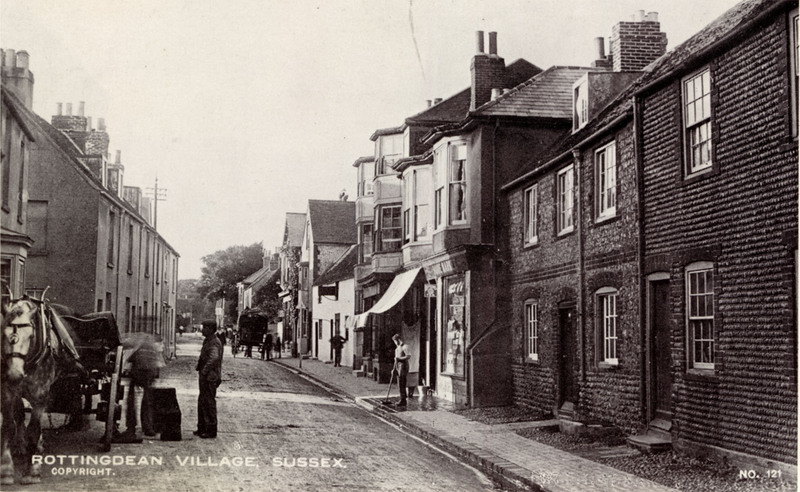 Around 1877, Nelson Stenning and his family moved to Rottingdean, where he established a bakery in the village's High Street. A son named Ernest Edward Stenning was born at Rottingdean in 1877. Another son, Walter George Stenning was born a couple of years later on 6th July 1879. When the 1881 census was taken, Nelson Stenning and his wife and children were living above the baker's shop in Rottingdean's High Street. Nelson Stenning is described on the census return as a "Baker", aged 30. Emily Stenning is not recorded in the household, but four year old Ernest and one year old Walter are both listed on the census return. At the time of the census, Nelson's thirty year old wife was pregnant with their second daughter Rosa May Stenning, who was born on 22nd May 1881. Elizabeth Stenning was to give birth to at least four more children over the next seven years, but only two of these survived infancy - Nelson Charles Stenning (born 3rd March 1887) and Arthur Harold Stenning (born 26th September 1888). On Boxing Day 1892, a photographer invited the Stenning family to pose outside Nelson Stenning's baker's shop on Rottingdean's High Street. Nelson and his wife Elizabeth were still wearing their work aprons when the photograph was taken, but their children put on their best clothes for the family portrait. SEE BELOW FOR A LATER GROUP PORTRAIT OF NELSON STENNING'S FAMILY TAKEN 14 YEARS LATER IN 1906, AFTER THE FOUR ELDEST CHILDREN HAD MARRIED. 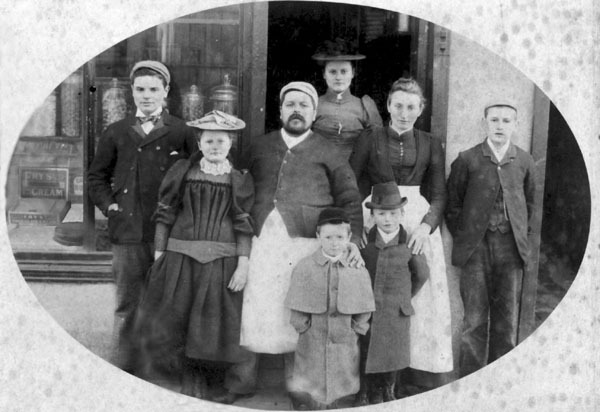 [ABOVE] A group portrait of the Stenning Family of Rottingdean, photographed outside Nelson Stenning's baker's shop in Rottingdean's High Street on 26th December 1892. Left to right at the back: Ernest (born 1877), Rosa (born 1881), Mr Nelson Stenning (born 1850), Emily (born 1875), Mrs Elizabeth Stenning (born 1850) and Walter (born 1879). 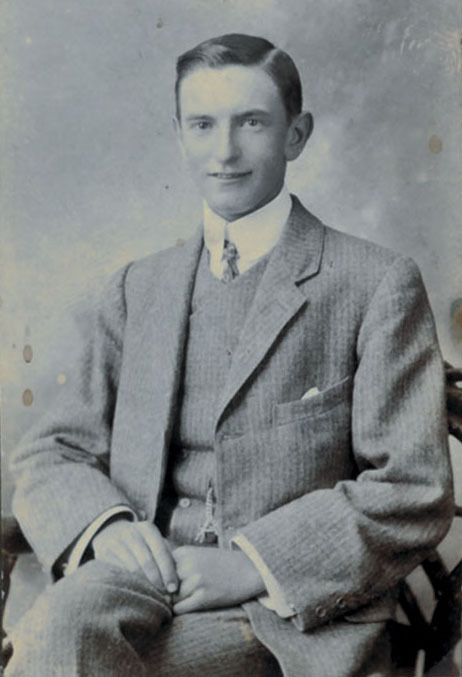 [ABOVE] A photographic portrait of Arthur Stenning, taken in Brighton around 1908 - the year Arthur emigrated to Australia. It appears that George West, Rottingdean's resident photographer, did not specialise in studio portraits and so Arthur had to make a special trip to the studio of "Mora" at 127 Western Road, Brighton. In December 1906, the various members of the Stenning family gathered at Nelson and Elizabeth Stenning''s home in Rottingdean to celebrate Christmas. 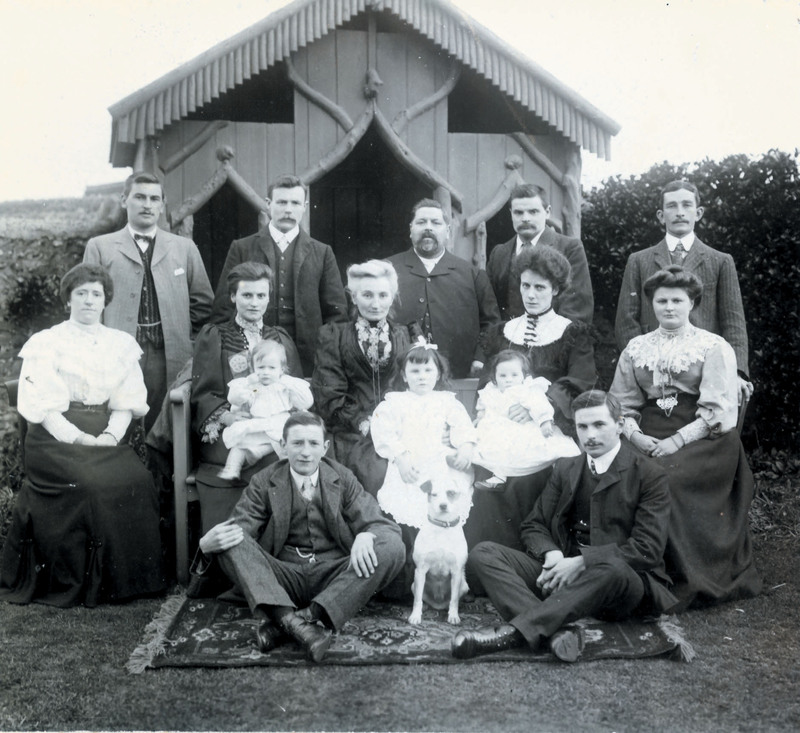 During that Christmas, the Stenning family were assembled in the back garden for a family portrait (see the group photograph above). By this date, four of Nelson Stenning's children had married. Emily Harriett Stenning, Nelson's eldest daughter had married Henry (Harry) French in 1897 and had settled in Plumstead. In 1906, the couple were the parents of two daughters - Edith Mabel (born 1900) and Lucy (born c1903). Ernest Edward Stenning, who had become the village blacksmith, had married Madeline Winifred Short (born 1879, Worthing) in 1900 and he had recently become the father of a baby daughter. In 1905, Walter George Stenning, who worked as a wheelwright in Rottingdean, had married Harriett Lilian White (born 1878), a teaching assistant in a local school. Walter's wife was the daughter of Adam White (c1825-1885), a shoemaker who had been a neighbour of Nelson Stenning in Rottingdean's High Street in the 1880s. Rosa May Stenning, Nelson's youngest daughter, had married Frederick Moppett (born 1883, Rottingdean) in 1905, when she was twenty-four and her young husband was just twenty-two. A year or so after this photograph was taken, Nelson Stenning's two married daughters - Mrs Rosa Moppett and her husband Fred and Mrs Emily French, with her husband and two children, emigrated to Australia. In the family photograph, the older male members of the family were posed at the back of the group, standing directly behind their wives, who were seated on a row of seats. The two youngest members of the family, eighteen year old Arthur and nineteen year old Nelson Charles sat cross-legged on a patterned rug. Nelson Charles Stenning (known as Charles in the family) trained as a baker under his father and went on to marry Florence P. Baker in Ipswich, Suffolk, in 1912. Arthur Harold Stenning served his apprenticeship as a carpenter and joiner and in 1908, at the age of twenty, followed his married sisters to Australia. Arthur Stenning settled in Belmont, Geelong, Australia, and on 20th June 1920 he married Irene Grenfell. Arthur and Irene Stenning had two children - Clifton Grenfell Stenning and Lucy Elizabeth (Beth) Stenning. Beth Stenning married Stuart Leslie Skinner in 1950. It is Mrs Beth Skinner who has kindly provided much of the Stenning Family History material on this webpage. [ABOVE] Staff Sgt. 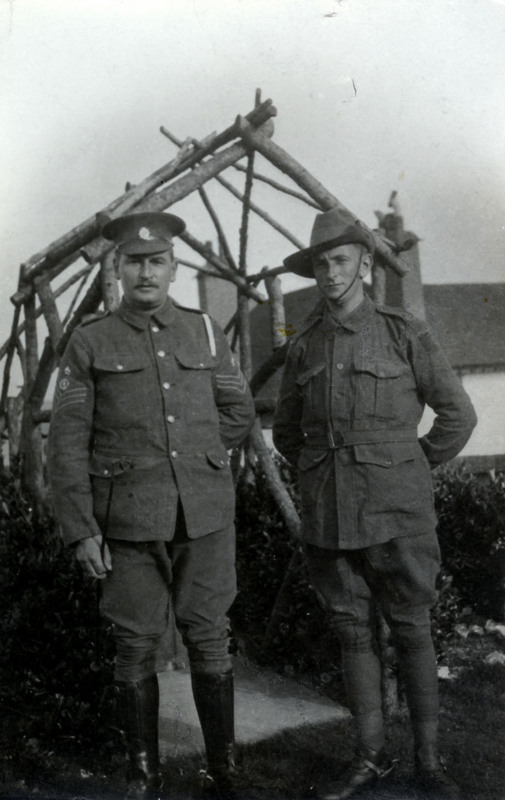 Walter Stenning and his younger brother Bmbr. 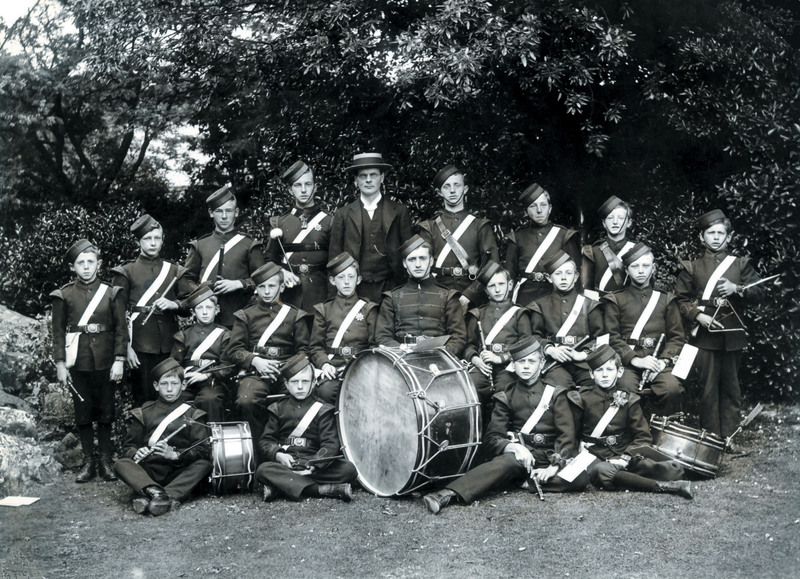 Arthur Stenning photographed at the family home in Rottingdean in 1916 while on leave. [ABOVE] A photograph of Ernie Stenning's Smithy in Vicarage Lane, Rottingdean, taken around 1908. Ernie Stenning, the village blacksmith, stands fourth from left in the centre of this group. Then in his early thirties, Ernie was Rottingdean's "Shoeing Smith" and is pictured holding a hammer in his right hand and gripping a horse-shoe with his left hand. The man behind the camera was probably George William West, a professional photographer who lived in Vicarage Terrace, very close to Ernie Stenning's Smithy in Vicarage Lane. 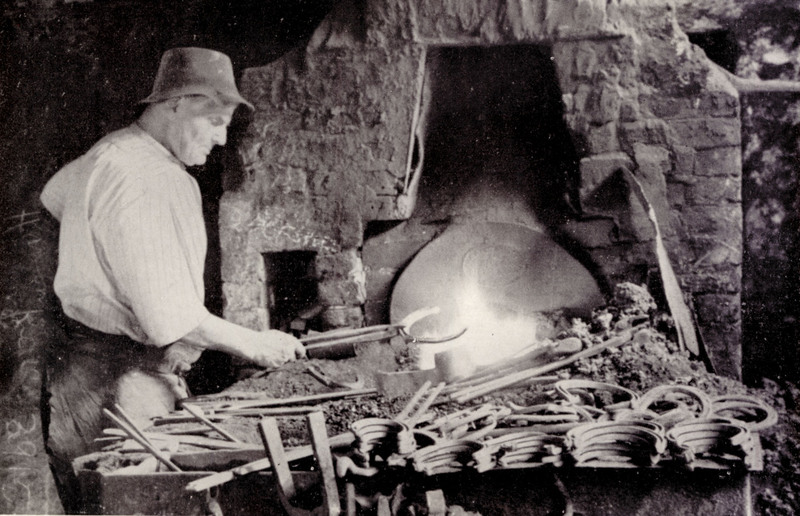 [ABOVE] Ernie Stenning at work at his forge in Rottingdean, photographed during the Second World War by amateur Brighton photographer Percy George Luck (1879-1965). By 1912, all of Nelson Stenning's children had flown the family nest. Nelson's married daughters, Mrs Emily French (1875-1955) and Mrs Rosa May Moppett (1881-1955) had emigrated to Australia with their respective husbands. Their younger brother, Arthur Harold Stenning (1888-1976) had followed his sisters to Australia in 1908. Charles Nelson Stenning (1887-c1932) had trained as a baker under his father and by 1915, Charles was running his own baker's shop at 95 Abinger road, Portslade. Another of Nelson's sons, Walter George Stenning (1879-1964) had moved away to Reigate in Surrey. When Nelson's wife, Elizabeth Lucy Stenning, passed away in Rottingdean on 25th September 1916, Walter and Arthur Stenning were serving in the armed forces. Nelson Stenning died at home at 'Belmont', High Street, Rottingdean on 12th April 1929 at the age of 78. By this date, Ernest Edward Stenning was the only one of Nelson Stenning's children still living in Rottingdean. Ernest Edward Stenning, Nelson's eldest son, was born in Rottingdean on 21st February 1877. Ernest served his apprenticeship at the local blacksmith's and when the 1901 census was taken he is recorded as a "Shoeing Smith", aged 24. On 6th June 1900, Ernest married Madeline Winifred Short (born 1879, Worthing), the daughter of Mrs Jane Short (born c1839, Ashington, Sussex), a widow who had recently moved to Rottingdean from Worthing. The union of Ernest and Madeline Stenning produced two daughters - Janet Lucy (born 1905, Rottingdean) and Margaret. Ernest Stenning established his own blacksmith business in Rottingdean around 1905. Ernest Stenning's smithy was located in Vicarage Lane, opposite the Plough Inn. 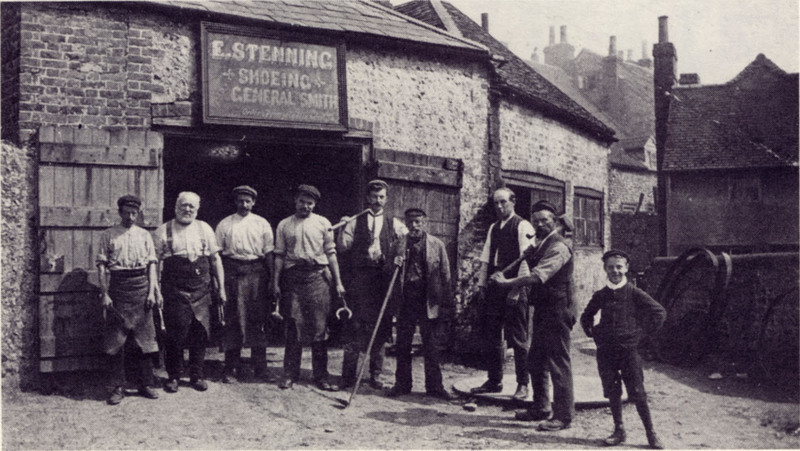 A photograph taken around 1908 shows Ernie Stenning and a group of workers outside the smithy under a sign which proclaims "E. STENNING, SHOEING & GENERAL SMITH". Ernie Stenning became a well known character in Rottingdean and he is mentioned by name in a number of books devoted to the history of the village. In a local directory published in 1928 , Ernest E. Stenning's residential address is given as 11 Nevill Road, Rottingdean and the address of his blacksmith's business is listed as East Lane, Rottingdean. Ernie Stenning worked as a blacksmith in Rottingdean throughout the Second World War, eventually retiring around 1950. Ernest Edward Stenning died in 1960 in his early eighties. Census returns : 1881, 1891, 1901 ; Trade Directories : Kelly's P.O. Directory (1878), Kelly's Directory of Sussex : 1890, 1891, 1899, 1905, 1911. Births, Marriages & Deaths : FreeBMD.